﻿ 2 Corinthians 4:4 Regarding them: the god of this age has blinded the minds of the unbelievers so they cannot see the light of the gospel of the glory of Christ, who is the image of God. in whom the god of this age has blinded the minds of the unbelieving, in order for the light of the good-news of the glory of the Christ (who is a likeness of God) not to shine forth to them. in whom the god of this world hath blinded the minds of the unbelieving, that the light of the gospel of the glory of Christ, who is the image of God, should not dawn upon them . For the god of this world has blinded the unbelievers' minds [that they should not discern the truth], preventing them from seeing the illuminating light of the Gospel of the glory of Christ (the Messiah), Who is the Image and Likeness of God. 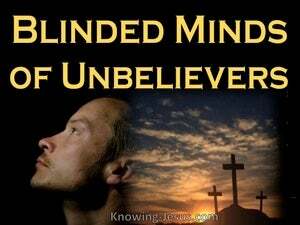 For the god of this world [i.e., Satan] has blinded the minds of the unbelievers, so that they would not see the light of the Gospel of the splendor of Christ, who is the image of God. whose unbelieving minds the god of this age has darkened, so that the light of the glorious gospel of Christ, who is the image of God, should not shine to them. 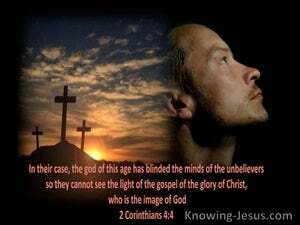 In their case the god of this world has blinded the minds of the unbelievers, so that they might not see the light of the gospel of the glory of Christ, who is the image of God. to those unbelievers, whose minds the God of this world has so blinded, that the glorious lustre of the gospel of Christ, who is the image of God, does not enlighten them. in whom the god of this world has blinded the thoughts of the unbelieving, so that the radiancy of the glad tidings of the glory of the Christ, who is the image of God, should not shine forth for them. in whom the god of this age has blinded the minds of those who believe not, in order that the light of the gospel of the glory of Christ, who is the image of God, may not shine on them. 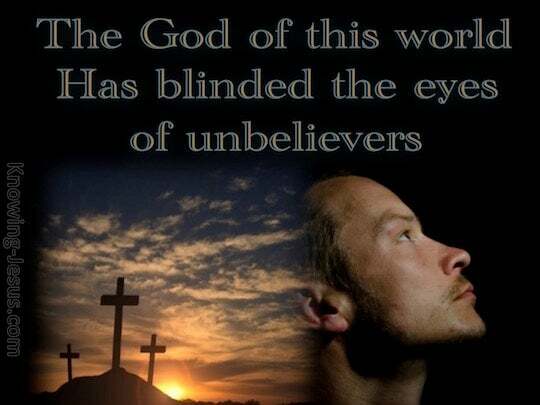 In their case, the god of this world has blinded the minds of the unbelievers, to keep the light of the good news of the glorious Christ, the likeness of God, from dawning upon them. Whose unbelieving minds the god of this world hath blinded, lest the illumination of the glorious gospel of Christ, who is the image of God, should shine upon them. In whom the God of this world blinded the minds of the unbelieving, so that the enlightening of the good news of the glory of Christ, who is the image of God, does not enlighten them. among whom the god of this age has blinded the minds of the unbelievers, so that they would not see the light of the gospel of the glory of Christ, who is the image of God. in whom the god of this world has blinded the minds of the unbelieving ones, so that the light of the glorious gospel of Christ (who is the image of God) should not dawn on them. in whom the God of this world hath blinded the minds of them which believe not, lest should shine unto them the light of the glorious gospel of Christ, which is the image of God. there the god of this world has blinded the minds of unbelievers, to prevent them seeing the light thrown by the gospel of the glory of Christ, who is the likeness of God. Among them the god of this age has blinded the understanding of the unbelieving so that the sunshine of the gospel of God, should not dawn upon them. in whom the god of this world has blinded the minds of the unbelieving, to prevent the light shining from the Good News of the glory of Christ, who is the image of God. in whom the God of this world blinded the understandings of the unbelieving, so that they cannot behold the light of the gospel of the glory of Christ, who is the image of God. in whom the god of this life has blinded the minds of the unbelieving, that the light of the gospel of the glory of Christ, who is the likeness of God, may not shine. In whom, the god of this age, hath blinded the minds of the unbelieving, to the end they may not discern the radiance e of the glad-message of the glory of the Christ - who is the image of God. among whom the god of this world hath blinded the minds of the unbelievers, that the light of the gospel of the glory of Christ, who is the image of God, should not dart its bright beams upon them. Men whose minds have been blinded by the God of this Age, unbelievers as they are, so that the light from the Good News of the glory of the Christ, who is the very incarnation of God, should not shine for them. In whom the god of this world hath blinded the minds of them who believe not, lest the light of the glorious gospel of Christ, who is the image of God, should shine to them. in whom the god of this present age has blinded their unbelieving minds so as to shut out the sunshine of the Good News of the glory of the Christ, who is the image of God. In their case, the god of this world has blinded the eyes of the unbelievers, to keep the glorious light of the good news of Christ, who is the likeness of God, from dawning upon them. in whom the god of this world blinded the minds of the unbelieving, that the light of the Gospel of the glory of Christ, Who is the image of God, should not shine upon them. who, existing in the form of God, did not consider equality with God as something to be used for His own advantage. No one has ever seen God. The One and Only Son- the One who is at the Father's side- He has revealed Him. I will not talk with you much longer, because the ruler of the world is coming. He has no power over Me. We know that we are of God, and the whole world is under the sway of the evil one. From Zion, the perfection of beauty, God appears in radiance. Jesus answered, "The light will be with you only a little longer. Walk while you have the light so that darkness doesn't overtake you. The one who walks in darkness doesn't know where he's going. And the one who sees Me sees Him who sent Me. For if what was fading away was glorious, what endures will be even more glorious. based on the glorious gospel of the blessed God that was entrusted to me.